Walker Books congratulates Mal Peet on his recent award success for his blistering account of celebrity and the power of the media in making and breaking people’s lives. Mal Peet is no stranger to awards success, having won the Carnegie Medal for his novel Tamar and the Branford Boase and Smarties Award for Keeper, his first Paul Faustino novel. Inspired by Othello, Exposure is an engrossing, revealing read for older teenagers and adults, tackling issues of race, fame, poverty and greed. Mal Peet's writing appeals to a wide audience, but it has been particularly praised for its ability to appeal to male teenagers. Believing that writing for teenagers does not necessarily mean writing about teenagers, Mal's cast of characters are primarily adult. The quiet star at the centre of this novel, as with his previous books Keeper and Penalty, is Paul Faustino (who some might say bears a few similarities to the author himself!). John C: That's a word if any author used they should be beaten with a big stick. It is a marketing exercise...cynicism...books that are aimed to draw in an adult readership and to do that you have to wink over the shoulder of the children to the adults. John C: You patronise both. You infantalise the adult and you patronise the child so everyone loses out. 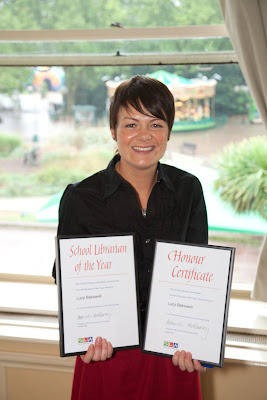 Congratulations to Lucy Bakewell of Hill West Primary School In SuttonColdfield - the SLA School Librarian of the Year 2009. Photograph by Philip Paul . Quentin Blake will be appearing on stage at the National Theatre in two platform events over the coming weeks. Saturday 3rd October 2009 at 10.30am Roald Dahl Day To celebrate the fourth annual Roald Dahl Day, his principal illustrator Quentin Blake will draw live on stage, in the company of actors who read from Dahl’s ever-popular books. This platform is followed by a book signing, but please note that Quentin will only be able to sign one book per person. Friday 13th November 2009 at 6pm Quentin Blake and David Walliams Little Britain’s David Walliams is joined by his illustrator to talk about his new children’s book, Mr Stink, a hilarious tale of family secrers….and a tramp in a shed. Tickets are £3.50, or £2.50 for concessions.